“I’ve always said I would be down to do like, a cameo with the WWE. I personally wouldn’t want to do like a two or three year world tour because I know there’s so much that goes into that. And especially now with the baby on the way and I don’t want to take that time away from my family. So…I would be open to a cameo possibly. 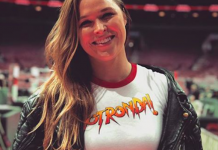 But with Ronda [Rousey] specifically… That changes things a little bit. It depends on how much we’d have to work together on the choreography… *laughs* before the cameo. Once each woman was in the UFC, they would meet again after each having one fight in the organization and then coaching against one another of season 18 of The Ultimate Fighter. 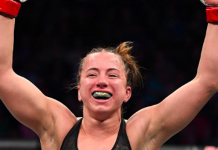 Rousey would come out on top once again in their UFC 168 rematch and at a time were expected to possibly meet for a third time after Tate went on an impressive four-fight win streak. However, Holly Holm would get the shot instead and the rest was history. That history including Tate becoming a UFC champion as well. Currently, Miesha Tate has been retired from MMA since UFC 205 which took place in November of 2016 and is expecting her first child while Rousey has just begun her new journey with the WWE(thus prompting the question for Tate). Do you think we’ll ever see these two working together in any facet?